I took a class this semester called “Science, Technology, and Society: Examining the Future through a Science-Fiction Lens.” For our final project we were to answer, in the form of an essay or creative work, the question “How do scientific discoveries, technological advances, and society pressures drive human change?” I wrote a song about language change on the internet. It’s not great production value, the video is just an exported PowerPoint, and yes I know that ASL is not the same thing as English so I shouldn’t have included those visuals in the second chorus without making more of a distinction but I was trying to illustrate the “and/or sight” concept and also I was originally just writing about language in general but then switched the subtitle to be English-specific since all my other examples were and now it is too late to change it because I’ve already submitted the link. Anyway. There are links in the video’s description. I like the vocals the in the STID version, but I think I have to give the edge overall to the music in X-Men:DoFP, because the last part of STID‘s music is just “BWAAAAM! BWAAAAM! BWAAAAM!”, but X-Men:DoFP‘s is a lot more musical, if admittedly generic. What do you think–which trailer uses the music better? I am not aware of the origin of this song of who wrote it, and I haven’t been able to find any credible information on it yet, but this doesn’t strike me as such an egregious trailer music choice as when Man of Steel used the score from Gandalf’s death scene. Maybe this is just one of those songs that gets featured in trailers a lot. A couple of months ago, some friends of mine (withVintage Faith Students in Manhattan, KS) demonstrated their immense creativity by writing and performing an original re-telling of the first third or so of J.R.R. Tolkien’s The Hobbit, as a musical. It was amazing. They modeled the aesthetic on Peter Jackson’s film The Hobbit: An Unexpected Journey and used the beards that I had made for their dwarf costumes, and commissioned* a Gandalf beard and Bilbo wig so they would all match. They stayed a little closer to the book than Jackson’s film, and they went a little further into the book than the movie left off. No word yet on whether they plan to follow up next year with another installment, but even if they don’t, the videos I’m posting below of The Hobbit: An Unexpected Musical Journey might be my favorite adapted-from-literature performance ever. *By “commissioned” I mean “asked me to do for free as a favor,” since this was a production by volunteer college students for their non-paying friends. For my troubles I received a copy of the script signed by one of the masterminds behind the project, who plays Thorin, a CD of their practice songs, and the immense pride of knowing that I contributed to this awesome play. Part 1: the dwarves arrive at Bag End where an unsuspecting Bilbo is about to be swept up into an adventure. The first song is verbatim from The Hobbit, and the second is from The Sound of Music with some lyrics changed to make it more Bilbo-y. (For each of these videos, if you click to watch them on youtube you can find all the lyrics in the video descriptions). How much do you love super-tall Gandalf?! He’s wearing stilts. Also, check out Thorin’s elaborate armor–it’s part spray-painted catcher’s leg gear, part woven placemats spray-painted silver so they look like chain mail. So creative! This was one of my favorite parts–this song kills me! It’s so funny, and so perfect! It’s to the tune of “Doe Re Mi” from The Sound of Music, but with all the lyrics changed so that it’s about teaching Bilbo the names and attributes of all 13 dwarves. It’s pure amazingness, and totally catchy. Song starts at 3 min. (Again, the lyrics are all in the video description on youtube). This scene picks up right after Bilbo rescues the dwarves from the trolls, (which happened off-stage in this production to avoid having to come up with a way to portray giant trolls that turn into stone). Bilbo misses a few lines in the song, but it’s based on “My Favorite Things” from The Sound of Music, except instead of “cream colored ponies and crisp apple streudels, doorbells and sleigh bells and schnitzel with noodles” he’s singing about “bacon with eggs and toast buttered like crazy, Snapdragons, lilies, laburnums and daisies.” (Song starts at 2:35). At the end, there’s a new interruption–a tra-la-la-ing elf! I also loved how they told so much of the story through this song, (which starts at 3:50), like Bilbo getting the ring from Gollum, fighting the goblins, and escaping the wolves. You can see an eagle flying in to rescue them at the very end right before the lights go down. You must be strong as an iron anvil! Defending family with every bone! Enduring the storms like polished granite stone! This is where Jackson’s movie cuts off, but An Unexpected Musical continues, with the dwarves entering Mirkwood forest sans Gandalf, who warns them not to leave the path. Bombur falls under an enchantment, and everyone gets hungry and homesick, which they sing about to the tune of “Red/Black” from Les Miserables. Maybe I was lying earlier when I said “Be a Dwarf” was my second-favorite, because I really love this one too! The re-working of lyrics so perfectly fits the characters and their backstories as told in the book. What would my parents think if they could see me now? Black – I can’t even pick a lock! (The song starts at the 3 minute mark, and the full lyrics are available in the video description on youtube.) In the end, the dwarves are temped to leave the path to try to crash the enchanted elvish party they think they can see in the woods, with disastrous results. So amazing. I’ve watched it dozens of times now and I still can’t believe how much work they put into this just for the fun of it, and how well it turned out. I love it, and I hope you did, too! 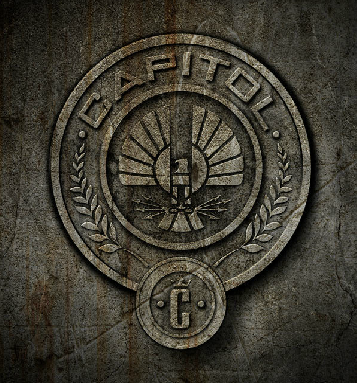 The Panem Capitol District seal from The Hunger Games movie. A Horn of Plenty for us all! And we shall never falter. One Horn of Plenty for us all! (My submission is in line with the general consensus on what the lyrics are over at the Hunger Games wiki.) I don’t understand why they don’t just officially release the lyrics somewhere. Someone obviously went to all the work of composing a song that could very plausibly be the national anthem of a totalitarian dystopian fictional government, so why not celebrate that? Officially releasing the lyrics could have been a useful marketing tool, to drum up excitement and discussion leading up the movie’s release about how well they fit the Panem we know from the books. It’s likely that many naive Capitol-dwellers actually believe these words represent the ideals their country strives for, that they feel patriotic when the Cornucopia symbol is featured in the Hunger Games prominently every year, not realizing the twisted irony that it’s overflowing with killing weapons instead of food. And I can totally picture someone like Seneca Crane superimposing the line “the brave shall heed the call” over an image of a dead Tribute, thinking it’s a respectful and appropriate homage, and pampered Capitol-dwelling viewers sniffle for a second while they watch the memorial footage reel of the same Tribute, before they get distracted by the latest gossip or fashion trend or a mirror. Meanwhile the dead Tribute’s parents and friends back in their home District interpret the same words as a threat, a reminder, that if they try to rebel against this terrible injustice to them and their children, the better-equipped, more-powerful forces of the government will “never falter” in crushing them back into submission. Cinna invites me to sit on one of the couches and takes his place across from me. He presses a button on the side of the table. The top splits and from below rises a second tablecloth that holds our lunch. Chicken and chunks of orange cooked in a creamy sauce laid on a bed of pearly white grain, tiny green peas and onions, rolls shaped like flowers, and for dessert, a pudding the color of honey. I try to imagine assembling this meal myself back home. Chickens are too expensive, but I could make do with a wild turkey. I’d need to shoot a second turkey to trade for an orange. Goat’s milk would have to substitute for cream. We can grow peas in the garden. I’d have to get wild onions from the woods. I don’t recognize the grain, our own tessera ration cooks down to an unattractive brown mush. Fancy rolls would mean another trade with the baker, perhaps for two or three squirrels. As for the pudding, I can’t even guess what’s in it. Days of hunting and gathering for this one meal and even then it would be a poor substitution for the Capitol version. I look up to find Cinna’s eyes trained on mine. “How despicable we must seem to you,” he says. Has he seen this in my face or somehow read my thoughts? He’s right, though. The whole rotten lot of them is despicable. “Why aren’t you eating?” asks Octavia. “I have been, but I can’t hold another bite,” I say. They all laugh as if that’s the silliest thing they’ve ever heard. Peeta picks one up to take a sip and they lose it. We’re quiet for a while. Then Peeta speaks in a strained voice. “You go along, thinking you can deal with it, thinking maybe they’re not so bad, and then you–” He cuts himself off. All I can think of is the emaciated bodies of the children on our kitchen table as my mother prescribes what the parents can’t give. Food. More food. Now that we’re rich, she’ll send some home with them. But often in the old days, there was nothing to give and the child was past saving, anyway. And here in the Capitol they’re vomiting for the pleasure of filling their bellies again and again. Not from some illness of body or mind, not from spoiled food. It’s what everyone does at a party. Expected. Part of the fun. My outrage when reading this scene is very similar to the disgust I feel when I consider the shamefully dishonest lyrics of Panem’s anthem. And that is why they are perfect. What Do Gandalf And Superman Have In Common? The first teaser trailer for the new Superman movie, Man of Steel, was recently released online. My first time seeing it was at the theater for the midnight premiere of The Dark Knight Rises. I thought at the time that the music sounded suspiciously like part of the soundtrack from Lord of the Rings, a score I am very familiar with since I have seen those movies dozens of times and the complete 3-disc soundtrack was my go-to music when I would stay up all night writing research papers for school. A quick visit to my ipod confirmed my suspicions–the music featured in the Man of Steel trailer is the last minute of a track titled The Bridge of Khazad Dum, from The Fellowhip of the Ring. Said bridge is in the Mines of Moria, and this is the music that accompanies Gandalf’s fatal fall into the pit with the Balrog, and the Fellowship’s immediate devastation. I mean, it’s exactly the same. It’s not “similar to” or “in the style of,” it’s actually the exact same piece of music. It’s not unusual for trailers to feature music from other movies, or to recycle something that won’t actually be in the finished product itself. This is, after all, a teaser trailer, so maybe they haven’t scored anything for the film itself yet. But it’s still strange to use music from such an iconic film, that is so recognizable. Howard Shore composed the music for Lord of the Rings, but Hans Zimmer is scoring Man of Steel, so they’re not even recycling from the same musician. I’m sure they chose this music because it’s haunting and dark and fits (or sets) the mood of the trailer very well. I’m sure they didn’t intend for me to start thinking about how Gandalf and Superman can be compared, if at all. But because this music is so strongly tied to Lord of the Rings, that’s exactly what I’m doing. Is it because both Superman and Gandalf resemble humans but are actually much more powerful and are sent to this earth for some greater purpose? (See TolkienGateway for the origins of wizards in Middle-Earth). Is it because they’re both kind of loners by default, having very few true peers? Is it because they do both value the less-powerful lives of their human/hobbit/dwarf/elf friends, and that love for humanity is seen by their foes as a weakness? Is it forshadowing that Superman will a) fight some sort of ancient evil like the Balrog, or b) sacrifice himself to save others less powerful than he? Is Superman going to “die” and be resurrected, the way Gandalf is, and actually the way Superman Returns ended? Is it because, right before Gandalf falls, he whispers, “Fly, you fools!” and the trailer ends with Superman flying? (That’s my favorite theory). I’m sure none of those comparisons were intended. But Warner Brothers underestimates the accuracy of my nerd powers of recollection if they expect me not to notice this sort of thing. And now all I can think about is, who would win in a duel of Gandalf vs. Superman? Vote, and give your reasoning in the comments below. I say Gandalf, with his staff. If Superman can take the staff away, then he’d win. 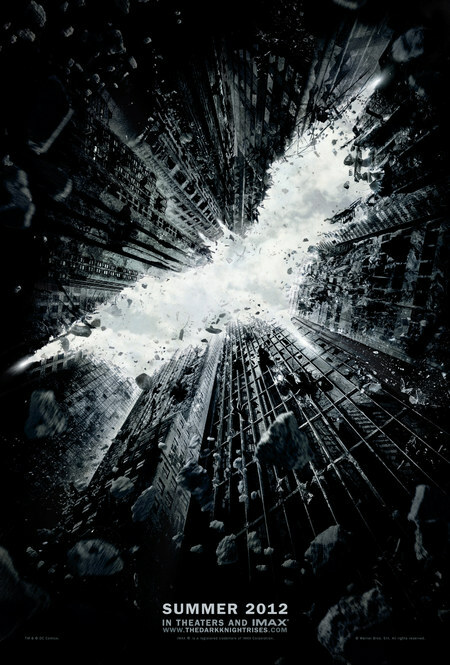 There has been a lot of speculation about the meaning of the thrilling, heart beat-increasing “bat chant”, featured in all of the trailers for The Dark Knight Rises. I’ll update after I see the movie (in just a few days! ), but I don’t believe that the chant involves existing words in any human language. (Here’s another fan analysis that comes to the same conclusion). I think it was just created for the film. Bane is from a fictional country anyway, so it’s not a stretch to create a fictional “language” or chant to go alone with him. According to one trailer, the chant means “rise” or “he rises,” but trailers don’t always give the full film context so I’m going to wait to see if the full movie gives any more hints to the actual meaning. Whether the chant is randomly combined phonemes or not, it’s existence and use in the film score is still meaningful because of the way in which it was recorded. Composer Hans Zimmer solicited thousands of volunteers online to record themselves repeating the chant, and mixed them all together. According to ujam.com, the site that was used to submit the recordings, people from 107 different countries participated. I mean, how cool is that, for all those people to be able to go to the movie on opening night and turn to their friend and say “that’s my voice, I’m part of that chant!” I’m very sad that I can’t brag about the same thing, because I didn’t find out about the submission request until a few days after it closed. The chant became a very complicated thing because I wanted hundreds of thousands of voices, and it’s not so easy to get hundreds of thousands of voices. So, we Twittered and we posted on the internet, for people who wanted to be part of it. It seemed like an interesting thing. We’ve created this world, over these last two movies, and somehow I think the audience and the fans have been part of this world. We do keep them in mind. And I thought it would be something nice, if our audiences could actually be part of the making of the movie and be participants in this. So, we’ve got this website up, www.ujam.com, where you can go on and be part of it. It was fantastic. The first Tweet that went out just melted our server because we had tens of thousands of people a second, trying to get onto the site. You always want to create a sound that nobody has ever heard, but I think, this time, we might be doing that. As a musician, I think about what environment things are recorded in. Now, you have hundreds of thousands of voices, all recorded in their own individual environment. Up until now, that’s been impossible to do. There’s a lot of people doing a lot of editing, as well. I can’t wait to see how the chant fits into the story in the film itself! The rythym of the chant on that final climb was closer to the way Hans Zimmer’s recording solicitation was set up; it would start out slow with the individual repeating the words in a call-back style, (so the computer would play “deh-shay” and then you’d say “deh-shay”, it’d say “basarah” and you’d repeat “basarah”), and then it got faster and you’d say all four words together. (The stress goes on the first syllable of each word, by the way). Before seeing the movie I had assumed that the chant would be connected to or representing Bane in some way, and it is mostly heard in the soundtrack while Bane is on-screen, but the only time it’s mentioned by the dialogue is in connection with Batman/Bruce Wayne. It is, after all, titled The Dark Knight Rises, so it makes sense that this cool chant element would relate to the title character and his title trajectory. He rises. When Bane starts talking to that agent guy on the plane at the beginning. It gets louder after the “No, they expect one of us in the wreckage, brother,” “But we started a fire,” “Yes, the fire rises,” exchange. When Gordon goes down the man-hole into the sewers, (which are filled with Bane’s henchmen,) chasing the perpetrators after the firefight at the bar where they find the missing congressman (and Catwoman/Selina Kyle cleverly escapes). When Bane walks onto the roof as a temporarily teamed-up Batman and Catwoman/Selina Kyle fight a group of baddies, (and Catwoman reluctantly goes along with Batman’s “No guns. No killing.” stance). The three times Bruce/Batman attempts to climb out of the pit, as well as the time he watches another prisoner try it. When the street full of cops moves toward the mob of Bane’s men. The chant starts out slow here and then picks up speed, similar to the way the individual recordings were made. ZOMG, the first trailer for The Hobbit is finally here! I love it. The dark filled all the room, and the fire died down, and the shadows were lost, and still they played on. And suddenly first one and then another began to sing as they played, deep-throated singing of the dwarves in the deep places of their ancient homes. To seek our long-forgotten gold. Rather important syntactically, (without them it sounds like the pines were roaring to the dungeons, or something), but maybe in the full version of this scene the song will be more complete. (The flames, by the way, are from “the dragons ire, more fierce than fire,” and there is also a stanza about goblins that was skipped over between the lines of the trailer song.) I do love that it is a new tune, and that it continues throughout the second part of the trailer. New music! I mean I love the Lord of the Rings soundtracks, and they instantly increase my level of excitement when Peter Jackson includes them in his vlogs as he has been doing, but these are new films and I’m so stoked to be getting new, epic music to go with them. (The score is by Howard Shore, who also composed the music for all three Lord of the Rings films). The tone of this trailer is undoubtedly dark. The song lyrics included talk about deep dark dungeons and burning landscapes, and several times Bilbo’s chances of survival are called into question, which I think is a little bit silly because we all know that this is a prequel and that he’s going to survive. I think they could generate excitement or market this as an action adventure full of dangerous escapades without trying to make us believe that Bilbo might die, don’t you? But they didn’t really need to work at convincing me to be excited for this movie anyway. I am duly excited. Maybe I will re-read The Hobbit during the holiday break! 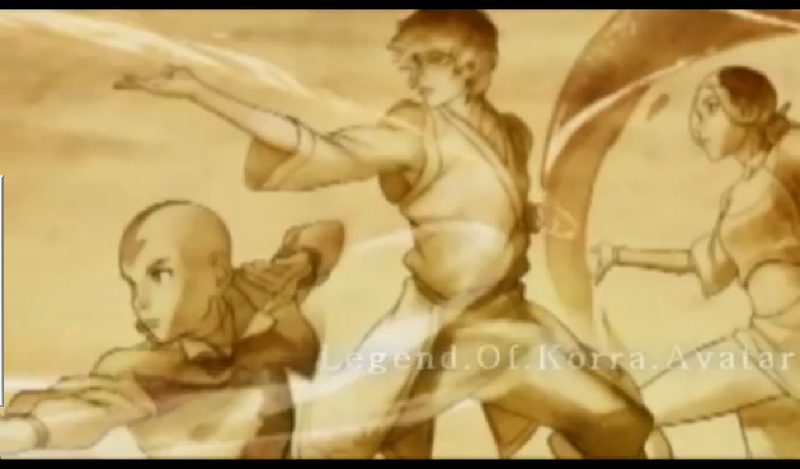 Avatar: Legend of Korra Opening! Thanks to Hypable, I just saw the opening sequence for Avatar: Legend of Korra! It seems to have been leaked, so who knows how long it will be up, but omg, it looks good and I can’t wait to watch this miniseries sequel to Avatar: The Last Airbender whenever they decide to air it. (Last time I checked there was no set start date April 14 has been announced as the air date for episode one!). Here’s a transcription of the voice-over, which is being narrated by Tenzin, who is Aang and Katara’s airbender son and who is going to have to teach the new Avatar Korra airbending. (I’m referring to stuff we learned from this year’s Comic-Con). Earth. Fire. Air. Water. When I was a boy, my father, Avatar Aang, told me the story of how he and his friends heroically ended the 100-year war. Avatar Aang and Firelord Zuko transformed the Fire Nation Colonies into the United Republic of Nations, a society where benders and non-benders from all over the world could live and thrive together in peace and harmony. They named the capital of this great land Republic City. Avatar Aang accomplished many remarkable things in his life, but sadly, his time in this world came to an end, and like the cycle of the seasons, the cycle of the Avatar began anew. So who are the benders in this intro? Are they all Avatars? 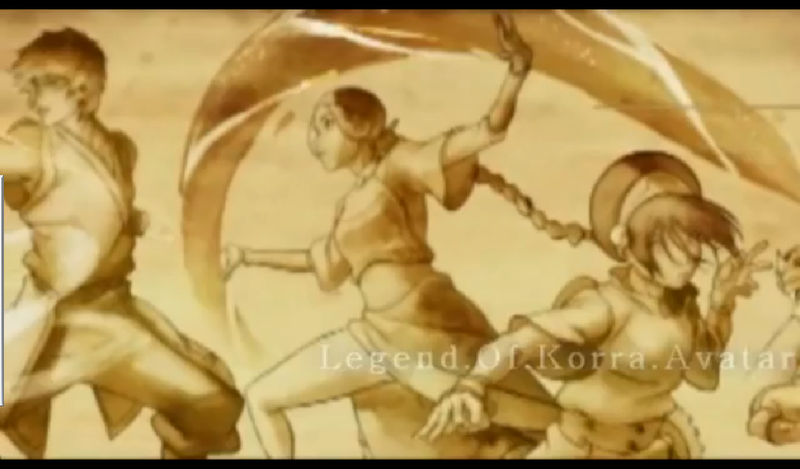 The earthbender is dressed as a Kiyoshi warrior, so it’s possible she’s Avatar Kiyoshi herself. The Firebender looks like Avatar Roku, although the quality of this video is not great and I can’t be sure whether his topknot is adorned with the Fire Nation jewelry that Sozin gave him. 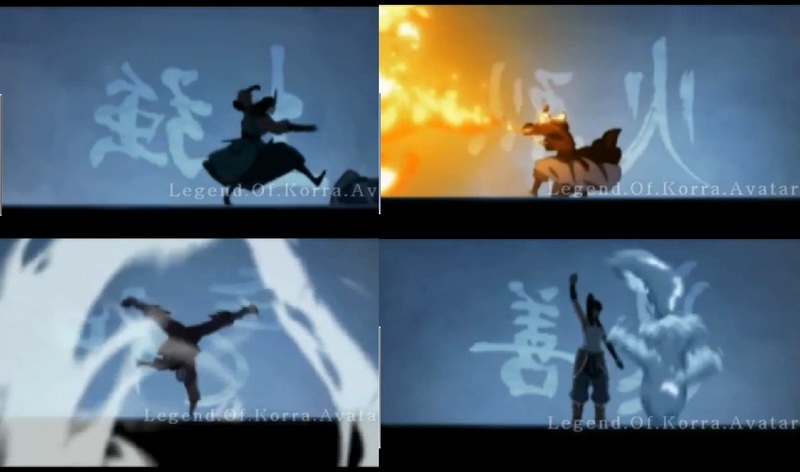 The airbender could be Aang, and obviously the waterbender is Korra. (**update** I now have screenshots from the proper, non-leaked opening sequence). At first I thought it sounded like Zuko had pretty much taken over the world with the blessings of Avatar Aang, (I LOVE that they pronounce Aang the way we all love and remember it, and not the odious ‘Ong’ from the live-action disaster of a film, by the way), but after closer inspection it sounds like it’s just the colonies that were united into a new republic, and the pre-existing nations still exist. Is that accurate? It still kind of sounds like Zuko taking over the world, though, because all the colonies were outside of Fire Nation territory, i.e. taking over someone else’s territory. Hmm. Is this not a way more sexualized Katara than was ever seen in the original series? I mean, I guess she practiced in her underthings sometimes. But here she’s showing a midriff and a thigh-high slit in her dress, which doesn’t resemble any outfits I remember seeing her in. Everybody else looks just like they did in the original show. Am I misremembering her? I suppose it’s possible she’s wearing tights, and now that I am really analyzing this picture it does look like she has long sleeves as well, and now I’m remember she did show some midriff in her Fire Nation disguise for half of season 3. Well, whatever then, but my initial reaction was to laugh because I thought maybe this sexier Katara version was how Aang described her when he told all these stories about their history. You know, embellishment. Also, because I’m a devoted Zutara shipper, I love the placement of the characters in this shot, like Katara is closer to Zuko than Aang. *sigh* If only. I am assuming this will not be the exact intro for each episode of Korra, just as the intro for Book One: Chapter 1 of The Last Airbender was different from all the other episodes, but I’m sure the part with the benders will be the same, and I guess Tenzin will probably narrate the other version too. Maybe it will say something about Avatar Aang being his father, and “now I must teach airbending to the new Avatar” or something? Oh, and it looks like the first episode will be titled “Welcome to Republic City,” and this season is being called “Book One: Air”, which will make it a nice companion to Books 1, 2, and 3 from ATLA which were titled Water, Earth, and Fire, but what will Korra’s Book Two be titled, if it gets one? Anyway, who else is excited for this?! I know I’m not the only one!